What makes Integrity different from other Buy Here Pay Here dealers? It starts with our inventory — but that’s just the beginning! 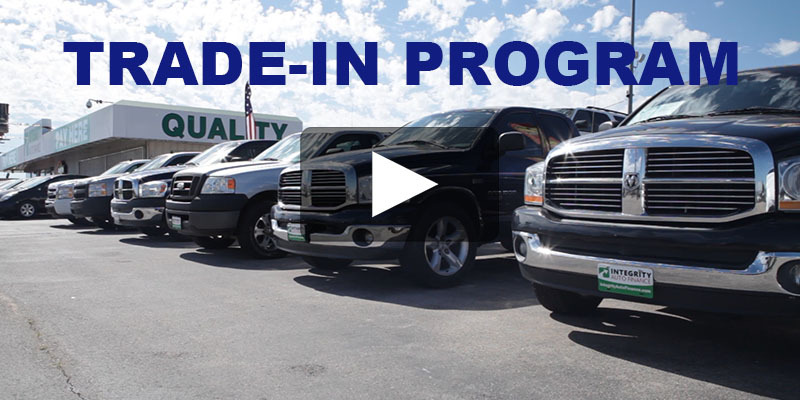 Check out the video below to learn about how we recondition our vehicles, our AutoPay rewards, and our incredible trade-in program! Narrator: It isn’t enough that we sell great cars. Integrity has a comprehensive program to make sure that they are in tip-top condition when you buy. We believe that we recondition our inventory to a higher standard than any other Buy Here Pay Here in Oklahoma. Bob McCaslin (Integrity Auto Service – Recon Shop Foreman): Here we are in the Integrity reconditioning shop again. As you can see, I’ve got all kinds of nice big trucks in here. I’ve got 3/4-ton; I’ve got some half-tons. We’ve been putting these nice wheel and tire packages on these trucks, trying to make these unique so that way you have something you can be proud of. Like we do with all of our vehicles here, we’ve been checking over the engines, transmissions, the brakes, the suspension — making sure that all of these vehicles are good and ready to go out and work just as hard as you are. We want these to be good, solid, and dependable. Ralph: I buy my trucks from Integrity Auto Finance because of the people and the quality of the trucks they put on the lot. Any issues I have, they take care of me all the time. Whether it’s big, small, whatever — they bend over backwards to make sure my truck is running because they know how important my truck is to me and my family. Narrator: Integrity makes it easy and convenient to make your payments with AutoPay. We know that it gives you peace of mind to know that you’re current and you don’t have to waste gas or time coming in to pay. Most places charge a convenience fee to pay with a debit card, but Integrity pays you with Auto Dollar Rewards. Each time your payment goes through, you’ll receive $5 in Auto Dollar Rewards that you can use towards your oil changes or service to your vehicle. When the time comes to trade in your vehicle, AutoPay will help you get lower payments and bigger discounts. Dontay Pompey (Sales Manager): Are you one of those people that instead of paying off your vehicle would much rather upgrade and get into a new vehicle after a few years? Well then here at Integrity, we have the trade program for you! I’m talking possible interest breaks and easier approval, not to mention that we give you more for your vehicle than anyone else, causing little to no rollover on the new loan. Just keep in mind, the better the condition of the vehicle at the time of trade, the more it’s worth. After trading your vehicle here at Integrity, we post the loan as “paid in full,” which helps increase increase your credit score. Preston Miller (Integrity Auto Service): Don’t neglect regular maintenance. Whenever you come to trade your car back in with us and upgrade down the road, if you bring us a car that’s clean and well-maintained, and if we’ve got records of oil changes and you’re taking care of the car — that means the world to us. We can give you a lot more for your trade-in if it’s well-maintained.